Language agency Tekstover delivers accurate subtitles, attentively written translations and high-quality editing work. We offer bespoke work to meet every client’s language needs. Subtitles provided by Tekstover ensure that viewers don’t get distracted from what is happening on screen. The subtitler always ensures that the text is coordinated with the images and speech, that the translation sounds natural and the text is easily readable in one blink of an eye. Tekstover also offers editing work of other translator’s subtitles. If dubbing is preferred, Tekstover takes care of all translations for dubbing activities from Spanish or English to Dutch. Clients are kindly asked to provide the script as well as the film material in the source language. In addition to subtitles, Tekstover also offers translations. If requested, a CAT tool (Déjà Vu X2) can be used to create the translation. If you have any translation needs in a language combination not mentioned above, please contact us. We have a wide network of skilled language professionals covering multiple languages. Tekstover delivers high quality. Any subtitles and translations to English or Spanish are edited by a second (native) translator before delivery. We offer competitive and bespoke pricing to meet each customer’s unique needs. Please contact us to discuss tariffs in more detail. We are more than happy to give you a noncommittal and appropriate offer. Discounts may be available for non-profit organisations and foundations serving social interests. Please contact me to discuss in further detail. I am Olga van Rhijn (1966). I am the owner of Tekstover and I am a certified translator Spanish <> Dutch. I pride myself to be accurate, driven, honest and versatile. Language is my life! 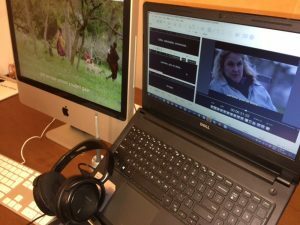 During my vocational education and internships, I learned all the tricks of the trade of translation and subtitling, including working with subtitling software Spot. Tekstover is registered with the Chamber of Commerce in Arnhem, The Netherlands, under number 67169961. Olga van Rhijn can be found in the Dutch register for certified Interpreters and Translators (Rbtv), under number 14525. She is also a member of the Dutch Authors Association, section Subtitlers (Auteursbond). Language agency Tekstover is compliant with the code of conduct and the General Terms and Conditions of the Dutch Association for Interpreters and Translators. Furthermore, Tekstover respects clients’ privacy. We treat your personal data in confidence and in accordance to the General Data Protection Regulation (GDPR). We only store your first and last name, address details, telephone number(s) and email address(es) and we do so only for a maximum of 3 years. For more information, contact us on email, WhatsApp or telephone.